When I received my acceptance letter to study journalism I thought I had chosen my direction in life. A year has now passed, and I have learned that I did not settle on a specific path at all. This education opens so many doors, and the university gives me the opportunity to discover what is behind these doors. I am now a good kind of confused. I have lost count on how many times I have said this the last year, but I will probably never get tired of that phrase anyway: All these people I get to speak to. The stories that they share with me, and I am allowed to tell others. It makes me feel really privileged. Out in the field for Newsweek. Photo: Signe Julie Andersen. The journalism education at the University of Southern Denmark (SDU) has given me the opportunity to tell so many stories: I have recently discussed the guerilla movement FARC with a former Colombian officer, questioned the function of a prayer room with Hetem, who is a Muslim, and met Mads who lives in polyamory, and tore down some of my prejudices. I am positive that it is these kinds of people I will continue to search for, but if their stories will be told with the help of a pen, a video camera or a dictaphone, only time will show. Our education covers all aspects of a possible journalistic career. Writing, radio, TV, or digital storytelling? I get to try it all. And that has left me with a doubt. But a great kind of doubt. Half a year for each of the above-mentioned areas does not leave me a specialist, but definitely a multi-skiller. In today’s journalistic practice where the internet is a thing and news happen every second, I am sure that making journalistic newcomers to multi-skillers is the right way to teach. I have learned to write a captive subhead, to create a picture universe for radio, and now I am just learning to edit a TV interview. But I am not only learning to “do” journalism, I am also learning how journalism historically has affected the world, how politics have an impact on journalists vis-à-vis, and how research and statistics will help me create a thorough and well-argued article. Academic subjects such as media law, international politics, and media language cover 38 per cent of the education, as depicted in the figure below. My first thought when I realized this was: Why? I just want to be a journalist. 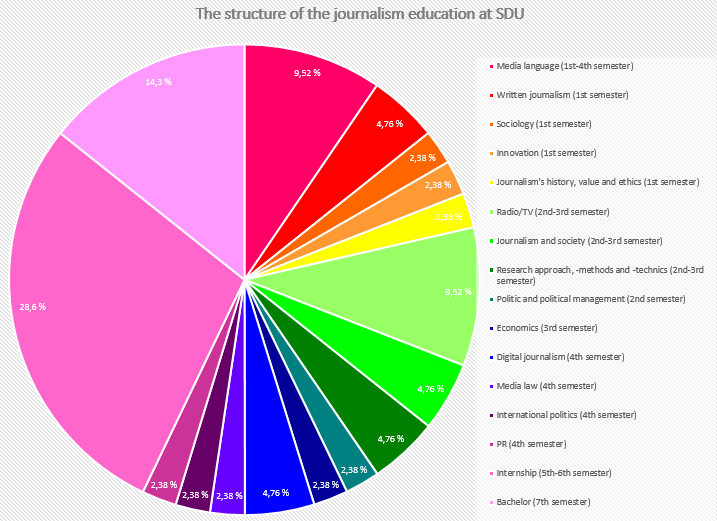 The structure of the journalism studies at the SDU. Please click to see a larger image. However, I have quickly realized that these subjects are what builds the foundation to become a knowledgeable and good journalist. The world of journalists is a battlefield. My fellow students and I know that we must have sharp elbows and do something extra besides the education. Luckily, the university got our back there. Do you want to be a newspaper editor? Join Lixen. Or are you more interested in getting better with picture and sound? 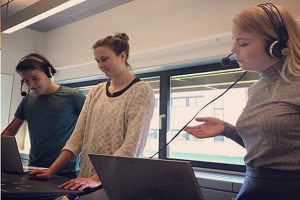 Well, Beton TV and Odense Studenterradio give you the chance. Reporting news in the morning radio. Photo: Christina Yoon Petersen. A little piece of advice? Do take these chances. Learn what excites you and what you are good at because two years during the education you must benefit from this knowledge, when you have to find an internship. One year of the studies is reserved for you to show your talent to a company and for the company to learn you how to work in the “real” world. I was just about to tell you that this is the first taste of the journalism industry outside the university, but that is simply not true. I dare to say that the education at the SDU is, if not the one, then one of the educations that couple learning with real life throughout. We speak to experts, politicians, and to other interesting citizens weekly. 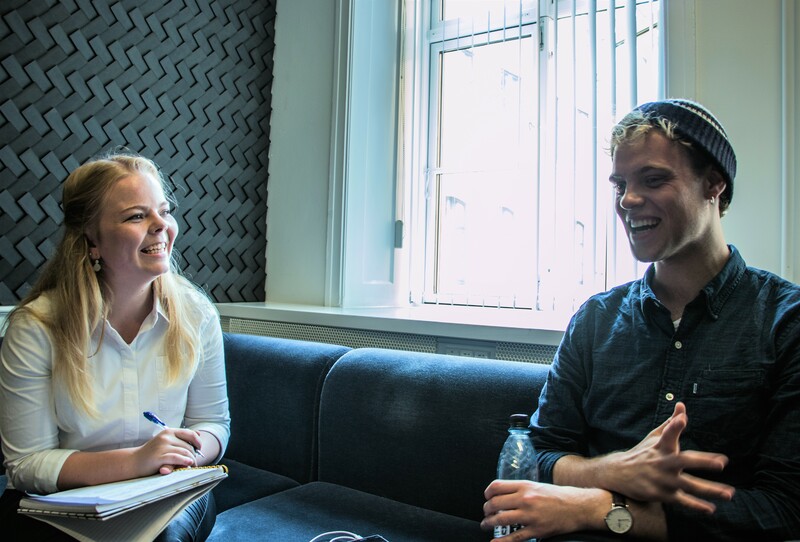 We visit radio and TV stations, and we even work for a local newspaper for a whole week. I have often heard that university students almost feel detached from the outside during their education. I certainly do not have this problem. A part of the detachment from the outside is the lack of socializing. Luckily, we do not miss out on that at all. 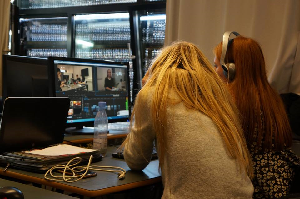 We consider ourselves a rather small education, we are no more than 200 students divided into two semesters walking around the journalists’ area, Medietorvet, at the same time. Most of them, including myself, moved to Odense from a long distance after getting in. That forces people to make new friendships, and so we did! Some of my fellow students have become people I do not know how to live without, and I thank the university, that I was “forced” to get to know these people. Editing the newest TV-assignment. Photo: Karoline Hedegaard. They are not only friends, they are also competitors. In a profession that is difficult to get noticed in, they urge me to become better at what I am already good at, because ‘good does just not cut it – we have to be great. And with the above-mentioned possibilities, I dare to say that SDU helps us more than we could wish. The rest is up to us. I am so excited to discover what the next year of school has in store for me before I (hopefully) find an internship. The author strives to become a journalist and began her path at the Danish Folk Highschool Krogerup, focusing on Journalism and Media. Afterwards, she stayed three months in the US studying News reporting and Writing at Bucks County Community College. 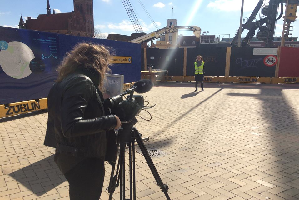 Now she is studying Journalism at the University of Southern Denmark while working as a web assistant at the Danish television station TV 2.